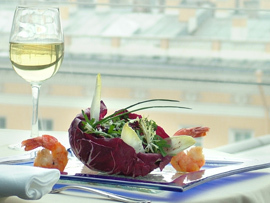 Executive Chef Philippe Bossert of Bellevue Brasserie at the Kempinski Hotel Moika 22 in St. Petersburg, Russia shares his creative recipes for a delicious three-course menu. 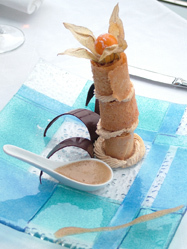 French Chef Philippe Bossert loves a challenge, which he definitely received when he arrived at the Kempinski Hotel Moika 22 on December 26, 2005, one week before the new hotel would host their first gala New Year's Eve celebration. Since then, he has settled into his new city, and is thriving in his position as Executive Chef of Beau Rivage and Bellevue Brasserie. His father is a chef and he grew up in the business, and when he was fourteen years old he worked at a three-star Michelin restaurant for three weeks, which helped his decision to study to become a chef. 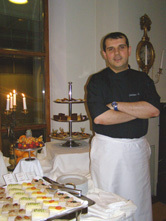 Chef Philippe Bossert said that his father's culinary style is Escoffier techniques, which he also uses, but it is not the same kitchen. His emphasis is on cooking lighter, using less butter and cream, without losing the taste. Chef Bossert's impressive career includes training under Alain Ducasse, working in Paris for the Department of the French Ministry, and at several Michelin-star restaurants throughout France. When he is not working, he spends his free time playing tennis in the summer, going to the museums, and discovering St. Petersburg. He believes "You need passion, and you need to give that passion to your staff." I had dinner at both the Beau Rivage and Bellevue Brasserie in November 2006, and it appears that he is succeeding in providing that passion. Clean the salad, cut into small pieces and toss with the dressing. Clean the prawns, cut in half, and put in tempura and water batter, and fry. 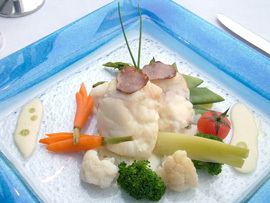 Poach the Monkfish for 8 minutes with the white truffle oil. Mix all of the ingredients and place in the refrigerator. Mix all of the ingredients and place in the refrigerator, until ready to prepare the waffles. Bake the waffles 5 minutes or until golden. Mix all of the ingredients and bring to a boil. Read other articles on the Kempinski Hotel Moika 22 in the Hotels and Resorts, and Restaurants sections.